History By Hollywood (2nd ed). 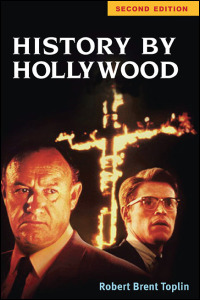 When the first edition of Robert Brent Toplin’s History by Hollywood was published in 1996, the book was among a cohort of publications that interrogated the relationship between film and history. Some of the others included Robert Rosenstone’s valuable Visions of the Past (1995) and Past Imperfect (1995), the collection of essays edited by Marc C. Carnes. This second edition of Toplin’s book remains substantially the same as the first edition. It consists of eight case studies, each focused on one film: Mississippi Burning (1988), JFK (1991), Sergeant York (1941), Missing (1982), Bonnie and Clyde (1967), Patton (1970), All the President’s Men (1976), and Norma Rae (1979). The case studies engage with the same question, namely: How does production history help us to better understand, and better judge, filmmaker’s use of historical events to tell compelling stories? New to this edition is an updated introduction, which includes a section devoted to the defense of “cinematic history” as practice, and a discussion of several films released since the first edition, including the notorious Pearl Harbor (2001) and the controversial The Reagans (2003). The film studies teacher will find much to use here, but the film studies scholar will be disappointed that there is so little formal analysis in Toplin’s studies. Attention to form would deepen his analysis without undermining his arguments. To use Mississippi Burning as an example: Toplin argues convincingly that the film deviated unnecessarily from the historical record when it made white FBI agents the heroes of its narrative and when it portrayed police vigilantism as a Civil Rights Movement tactic. The filmmakers thus opened themselves up to criticism on the grounds of authenticity, and the film “represents a lost opportunity” to be remembered instead as a “movie that effectively portrays an important problem in human relations” (44). In this chapter, Toplin usefully reconstructs the film’s production history in order to account for the changes in the screenplay, showing how decision-making by the screenwriter, the director, the producers, and the studio executives helped to shape the film’s historical narrative. This background helps explain how the film ended up telling the story that it tells, but it doesn’t explain how the film makes its emotional impact – and it strikes me that the impact on the viewer is a major reason that Mississippi Burning is worth paying attention to. While reading this chapter, I remembered that my negative response to this film was not only due to the narrative marginalization of the African American participants in the Civil Rights Movement. I responded, too, to black characters’ sustained construction by the camera as passive subjects in their own story. More analysis of the filmmakers’ methods of storytelling, in addition to analysis of the stories, would add an additional, and important, dimension to Toplin’s perspectives. As Toplin rightly argues, the issue at stake is not whether cinematic history, as written by Hollywood, is right or wrong in its interpretation of real events. Whether more or less accurate to the historical record, filmic narratives circulate more widely than historical monographs that display the results of similar – if more tightly regulated – labor of collection and creation. Our job as scholars, then, is to continue to do what Toplin offers us here: to use films to help us ask and answer our own questions about history, Hollywood, and what to make of the relationship between them.